You can listen to 'Flower in your hair here. In the first minute of the first song 'Flower in your hair' I had already heard about 50 direct references, in the music and the way the singer phrases certain lines and that in a song that turned out to be no longer than 1.50 minutes. And the song is fun too. Conclusion, totally unoriginal and another limb to the new folk revival that broke big with Mumford & Sons, a band I still haven't made peace with, if I'm honest here. And here I'm writing on The Lumineers. Is there something wrong in the universe? The Lumineers is a trio (with two touring members) consisting of Wesley Keith Schultz singing and playing guitar, Jeremiah Caleb Fraites on drums and Neyla Pekarek on cello and vocals, based in Denver, Colorado. Doing some research on Wikipedia, I found that this band is already huge in the U.S., Canada and the U.K., selling out Shepard's Bush Empire and now on to the Brixton Academy. I'm not surprised as The Lumineers is totally in-sync with what is popular. The unavoidable Mumford, but also Of Monsters and Men that is growing larger by the day and Edward Sharpe and friends, that I can't even really tell part from the Iceland based band. And I like The Lumineers a lot better than Mumford. 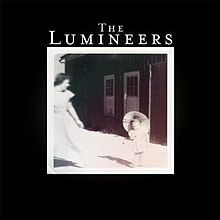 The only way I can explain it, is that The Lumineers sound like they mean it and lived it. To my ears they go an emotional level deeper, descend into their own private hell here and there. Listening to 'Slow it down', stripped bare of all but voice and guitar for the first half of the song, goes deep. The rasp in Schultz' voice tells it all. The Lumineers fall into the steps of a long line of folk musicians. from everyone before Dylan, the venerable Bob himself and everyone after. Along the way the band picked up that slight pop feel, that makes the music so popular from 2009 onwards. This undefinable element that makes this music commercial all of a sudden, packing arenas pretty soon. Something that I hope a singer-songwriter like Shane Alexander is able to profit from also with his upcoming album. The Lumineers is an album that I like despite my first misconception because of "the new Mumford & Sons" moniker. Always listen first is my credo, before adopting a firm opinion (and sometimes even passed that). In 'Big parade' The Waterboys shine through. 'Flapper girl' could have been written by Adam Carroll. His song about ducks, Schlitz, levee and rusted combines (Errol's song) is at least as good as 'Flapper girl', so listen to the man! The Lumineers prove that not all songs need to be huge. Whether its fans are really aware of this, time will tell. For now the band produced a great debut album, that it will be touring behind for a while.